I tried the Casmara Algae Facial Mask at Skin Perfect Clinic and it was awesome. Truth is, I'm obsessed with facials. I used to have really bad skin growing up, but I learned that you can never go wrong with a good skincare routine (these days, I'm trying Shiseido's Ibuki line), and a monthly visit to your fave facialist. So I got really excited when my friend Ria Yap invited me to try the Casmara Algae Facial Mask at Skin Perfect Clinic in Robinson's Magnolia. What I love about Skin Perfect is that the facialists really, really take care of you. Not only do you get an intensive cleaning process that involves brushing, steaming (your pores need to open up so the facialist can extract your blackheads and whiteheads), and vacuuming dirt and residude away from your face. You also get a relaxing head, shoulder, and back massage! Sure, the pimple pricking hurts. But who here ever got out of a facial with a dry eye anyway? The highlight of it all is the algae mask. The facialist covered my entire face with it—my eyes and lips included. She left my nostrils out so I could breathe (whew! ), but I felt so claustrophobic for 20 minutes! The mask dried, and the facialist took it off. And when she did, I was so impressed with how my skin looked. My pores seemed smaller, my face smoother, and the redness from the pimple pricking was gone. I've tried so many facials before, and my skin never looked this good. Wanna try their services, too? 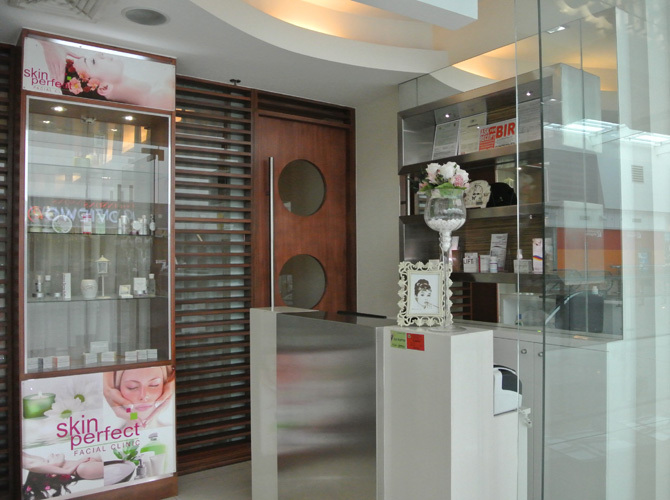 Visit Skin Perfect at 3/F Robinsons Magnolia, Aurora Blvd. cor. Dona Hemady St. Quezon City. Let me know how your first visit goes!